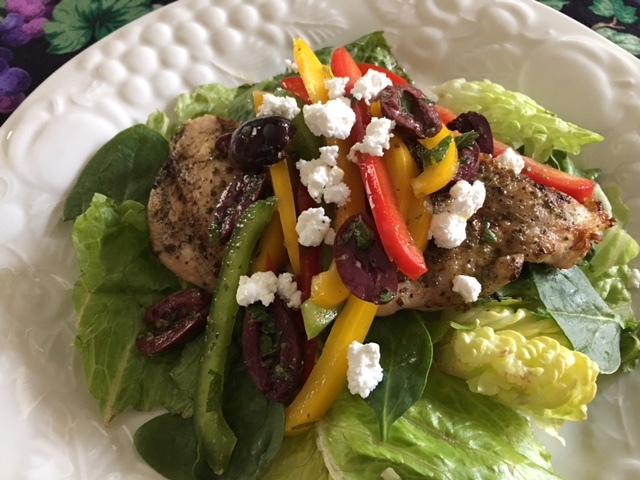 Like most of us, when faced with making dinner, I want it all – easy, quick, tasty, nutritious, visually appealing, and with minimal dish-dirtying. Of course, it would be great if it incorporated chicken, a go-to staple in the fridge. And then there is also my current requirement, that it must be Whole 30 compliant. Ahhh…the things we go through to be better, healthier, blah, blah, blah. You know the deal. So…I think this recipe (sans feta and Tzatziki) checks all the boxes. It is easily assembled, cooks very quickly, and looks like you went to way more trouble than you did to prepare it. 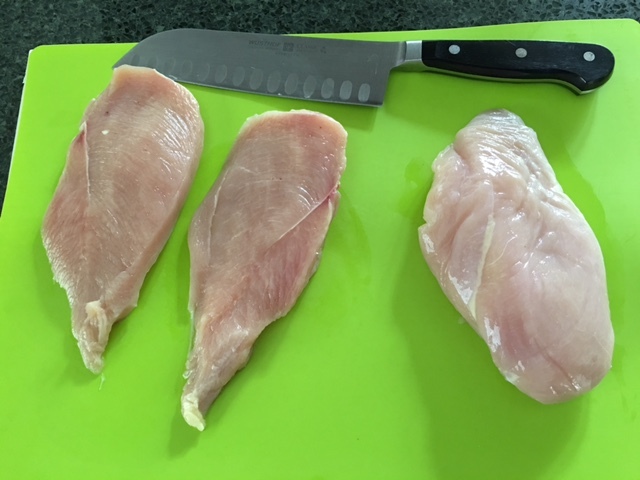 Part of the secret is halving the boneless chicken breasts horizontally. This is best accomplished by placing the chicken breasts in the freezer for about 10 minutes before slicing them. They firm up a bit, making the horizontal slicing easier. The resulting “paillards” are fairly even in thickness, and will cook quickly, thus keeping them tender and moist. Seasoning with salt and pepper is fine, but I really LOVE Penzey’s Greek Seasoning (available online www.penzeys.com). I prefer grilling the chicken, but a quick pan-sear is fine, too. Remember, we’re trying to make this EASY! I hope you’ll give this a try. If you are not eliminating dairy from your diet, indulge in the addition of a yummy feta and the dollop of Tzatziki. It’s really good! Fun fact: To legally be real Greek feta it must be made of 70% sheep’s milk and 30% goat’s milk. Anything else is “in the style of feta” but not a true feta. Now you know! Mix together the peppers and olives. In a small bowl, whisk together the oregano, mint, garlic, and lemon juice. Slowly drizzle in 6 tablespoons of the olive oil. Season with salt and pepper. Pour over pepper mixture. Toss lightly, and set aside at room temperature. Brush chicken breasts with remaining olive oil. Season with salt and pepper, or Greek Seasoning. Grill, turning once, until done – about 5 minutes total. Mound salad greens on serving plates. Top each with grilled chicken, and top with pepper mixture, including the marinade. Sprinkle each portion with feta. Enjoy with a dollop of Tzatziki on the side. Place finely chopped cucumber in a sieve, and let drain at least 30 minutes. Place in a clean dish towel or cheesecloth, and squeeze to remove any excess moisture. Combine with remaining ingredients and chill until serving time.